Continuing Speaker–listener neural coupling underlies successful communication here. Done! Will promote to Phlog later. The remarkable collective action of organisms such as swarming ants, schooling fish and flocking birds has long captivated the attention of artists, naturalists, philosophers and scientists. Despite a long history of scientific investigation, only now are we beginning to decipher the relationship between individuals and group-level properties. This interdisciplinary effort is beginning to reveal the underlying principles of collective decision-making in animal groups, demonstrating how social interactions, individual state, environmental modification and processes of informational amplification and decay can all play a part in tuning adaptive response. It is proposed that important commonalities exist with the understanding of neuronal processes and that much could be learned by considering collective animal behavior in the framework of cognitive science. The Socio-Temporal Brain: Connecting People in Time – this looks like it might explicitly link human neural coupling and flocking. Temporal and social processing are intricately linked. The temporal extent and organization of interactional behaviors both within and between individuals critically determine interaction success. Conversely, social signals and social context influence time perception by, for example, altering subjective duration and making an event seem ‘out of sync’. An ‘internal clock’ involving subcortically orchestrated cortical oscillations that represent temporal information, such as duration and rhythm, as well as insular projections linking temporal information with internal and external experiences is proposed as the core of these reciprocal interactions. The timing of social relative to non-social stimuli augments right insular activity and recruits right superior temporal cortex. Together, these reciprocal pathways may enable the exchange and respective modulation of temporal and social computations. Word embeddings use vectors to represent words such that the geometry between vectors captures semantic relationship between the words. In this paper, we develop a framework to demonstrate how the temporal dynamics of the embedding can be leveraged to quantify changes in stereotypes and attitudes toward women and ethnic minorities in the 20th and 21st centuries in the United States. 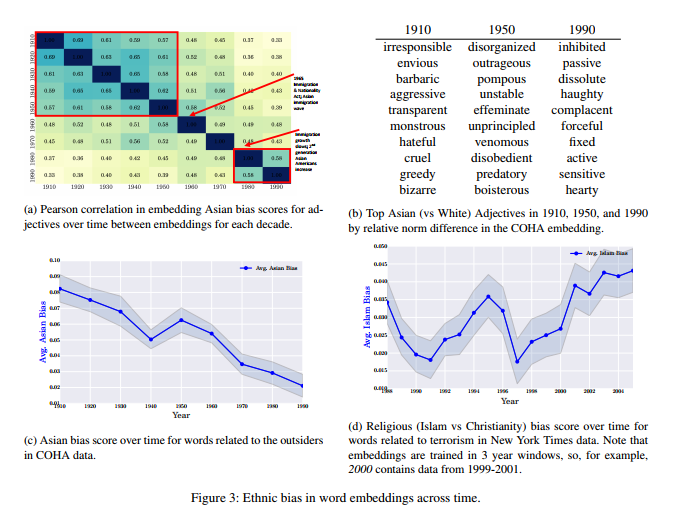 We integrate word embeddings trained on 100 years of text data with the U.S. Census to show that changes in the embedding track closely with demographic and occupation shifts over time. The embedding captures global social shifts – e.g., the women’s movement in the 1960s and Asian immigration into the U.S – and also illuminates how specific adjectives and occupations became more closely associated with certain populations over time. Our framework for temporal analysis of word embedding opens up a powerful new intersection between machine learning and quantitative social science. I think this is really close to the belief trajectories I’m trying to tease out. In the figures above, note that it is possible to extract both trajectories and normative terms. Plus, the paper has a really good writeup of methods in the appendices. Extracting Automata from Recurrent Neural Networks Using Queries and Counterexamples <- Agent generation is a thing! We address the problem of extracting an automaton from a trained recurrent neural network (RNN). We present a novel algorithm that uses exact learning and abstract interpretation to perform efficient extraction of a minimal automaton describing the state dynamics of a given RNN. We use Angluin’s L* algorithm as a learner and the given RNN as an oracle, employing abstract interpretation of the RNN for answering equivalence queries. Our technique allows automaton-extraction from the RNN while avoiding state explosion, even when the state vectors are large and fine differentiation is required between RNN states. We experiment with automata extraction from multi-layer GRU and LSTM based RNNs, with state-vector dimensions and underlying automata and alphabet sizes which are significantly larger than in previous automata-extraction work. In some cases, the underlying target language can be described with a succinct automata, yet the extracted automata is large and complex. These are cases in which the RNN failed to learn the intended generalization, and our extraction procedure highlights words which are misclassified by the seemingly “perfect” RNN. A long term goal of Interactive Reinforcement Learning is to incorporate nonexpert human feedback to solve complex tasks. Some state-of-the-art methods have approached this problem by mapping human information to rewards and values and iterating over them to compute better control policies. In this paper we argue for an alternate, more effective characterization of human feedback: Policy Shaping. We introduce Advise, a Bayesian approach that attempts to maximize the information gained from human feedback by utilizing it as direct policy labels. We compare Advise to state-of-the-art approaches and show that it can outperform them and is robust to infrequent and inconsistent human feedback. While explanations may help people learn by providing information about why an answer is correct, many problems on online platforms lack high-quality explanations. This paper presents AXIS (Adaptive eXplanation Improvement System), a system for obtaining explanations. AXIS asks learners to generate, revise, and evaluate explanations as they solve a problem, and then uses machine learning to dynamically determine which explanation to present to a future learner, based on previous learners’ collective input. Results from a case study deployment and a randomized experiment demonstrate that AXIS elicits and identifies explanations that learners find helpful. Providing explanations from AXIS also objectively enhanced learning, when compared to the default practice where learners solved problems and received answers without explanations. The rated quality and learning benefit of AXIS explanations did not differ from explanations generated by an experienced instructor. This entry was posted in Phil, proposals on November 28, 2017 by pgfeldman.